Heat oven to 350°F. Line large baking sheet with cooking parchment paper. In medium bowl, mix pork and green onions. Separate dough into 8 biscuits. Press each biscuit into 4-inch round. Divide pork mixture among biscuit rounds, placing about 2 tablespoons in center of each round. Gather dough around filling, and pinch to seal. Place each bun, seam side down, on baking sheet. In small bowl, mix egg and soy sauce. Brush top and sides of each bun with egg mixture. Discard any remaining egg mixture. Bake 20 to 25 minutes or until deep brown and filling reaches 165°F on an instant-read thermometer OR freeze and bake later as directed in Step 5. If making ahead to bake and serve at a later date: Assemble buns on cooking parchment paper-lined baking sheet; do not brush with egg mixture. Freeze unbaked buns, uncovered, 45 minutes to 1 hour or until biscuits are very firm. Label 1-gallon resealable freezer plastic bag. Transfer buns in single layer to bag; remove as much air as possible, and freeze up to 3 months. To bake: Line baking sheet with cooking parchment paper. 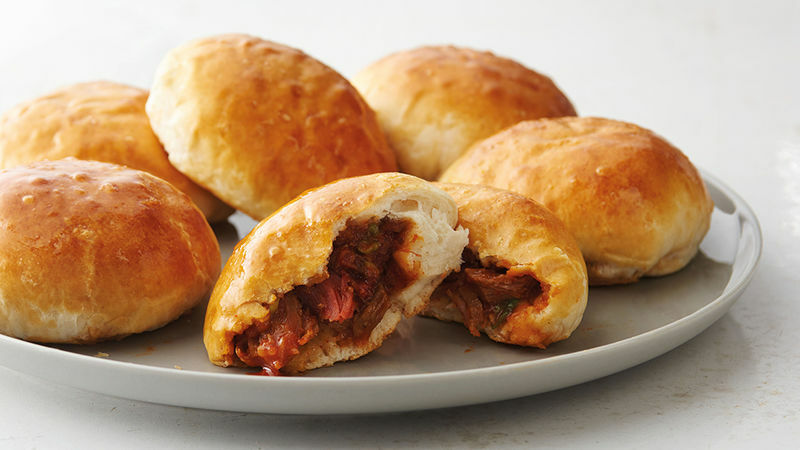 Place frozen buns on baking sheet. Bake 25 minutes; brush with egg mixture. Bake 9 to 11 minutes longer or until deep brown and filling reaches 165°F on an instant-read thermometer. Use prepackaged and sauced barbecued pork, or homemade sauced pulled pork shoulder. Be sure to firmly pinch together the biscuit dough before turning the buns over to make sure the filling stays inside the buns.